This term for concept we have been learning about Science!! We have been learning about Matter, Transformation, Scientists and lots of different experiments!! It has been so much Fun !! We decided to do a short Skit about Earthquakes because well.. \we all love talking about Earthquakes and we guess that does relate to Science! We enjoyed working as a team and sharing our ideas. This learning experiance has been a fun way to demonstrate what we know and what we have learnt about Earthquakes. For concept this term we have been learning that we are all on a learning journey, learning with and from each other and also we are all on this learning waka, we need to paddle together. "He Waka Eke Noa"
This week we focused on "Team Work" and all the things that we need to remember when we are working in a team. This year we have the pleasure to have buddy time with the Wonderful Miss Galt and her class Room 4. 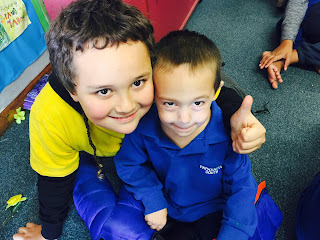 We meet every Friday afternoon in our class where we get to spend time with our buddies and acknowledge each others learning and end our week on a happy positive note! Buddy time for us means having a little junior student we get to look out for through out the year as well as teach them about things that we learn in class. We enjoy getting to know them more and more and seeing them develop as the year progresses. During buddy time we share with them things that we have been doing in class, sometimes Miss Galt and Miss Hamid organises a fun Art activity to do, we sing and do just dance, go outside for a game or play some inside games and at the end of each buddy time the teachers always hand out Certificates to students as well as let US praise our friends or someone in particular that has demonstrated one of the 3 B's throughout that week.